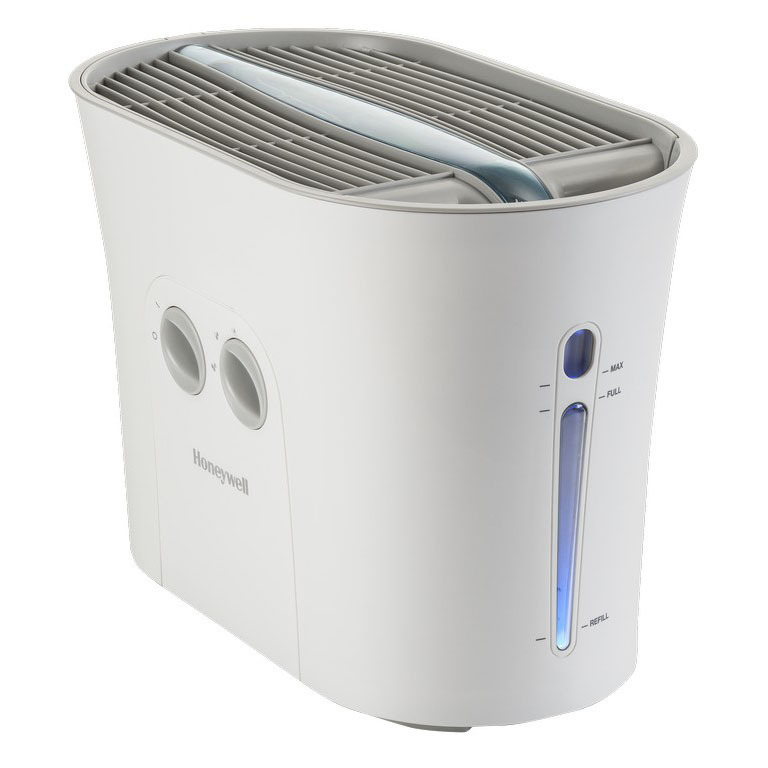 The well-known Honeywell humidifiers include a huge array of portable as well as whole house humidifiers. You can surely believe in the performance of these units as they all keep your homes comfortably humidified across the colder months. 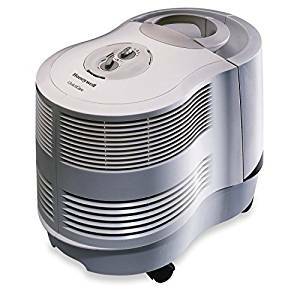 Manufactured by the well-known company Kaz Inc., the Honeywell portable as well as whole-house-humidifiers make use of patented reliable QuietCare tech that helps them to operate 30 percent more quietly as compared to the other brands. Humidifiers series by Honeywell also include the portable console humidifier which can freely be moved throughout the house and also include in-duct humidifiers which can be installed on to your forced-air furnace. WHOLE-HOUSE DUCTED / HVAC DUCTED HUMIDIFIERS – COVERED AREA UP TO 4000 SQ. FT.
WHOLE-HOUSE CONSOLE PORTABLE HUMIDIFIERS – COVERED AREA UP TO 2600 SQ. FT.
SMALL ROOM – COVERED AREA UP TO 325 SQ. FT.
Honeywell is a popular supplier of home comfort solutions for more than a century. The company has perfected whole house humidifier technology with its amazingly efficient, comfort-enhancing console humidifiers. 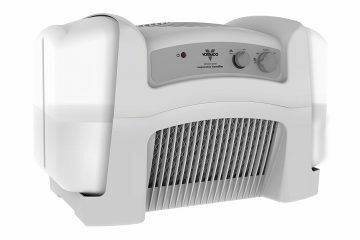 The QuietCare Humidifier models gives you comfortable and cool moisture to cater the need of larger spaces and operate at 30 percent quieter as compared the other humidifiers out there. They ensure this by the utilization of patented noise reducing insulation and low-sound built in fans to each and every unit in order to promise and deliver high-speed, ultra-quiet operation. In order to provide ultra-efficient humidification across the home, pick Honeywell Furnace Humidifier that are compact yet larger capacity humidifiers that are installed on your forced-air furnace as integrated to the water supply of your home. They provide healthy and comfortable moisture when you heat your home. Every model include easy installation instruction manual, simple humidity controls, hassle free maintenance to keep you relax across the winter season. 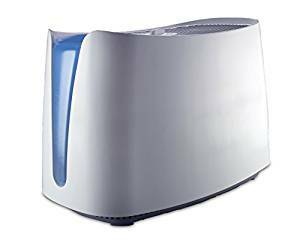 Read the short reviews of some popular whole house humidifiers. 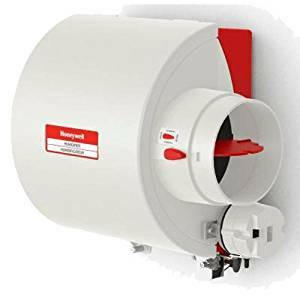 HE360 Powered Flow Through Whole House Humidifier by Honeywell is an easy to install solution to damaging and uncomfortable symptoms dry air. It works in integration to HVAC system and disperse soothing moisture to a home up to 4,500 sq. ft. area. It features variable speeds as well as multistage system. It also includes wall mountable and a duct humidistat to offer easy controls. Just mount it directly to warm supply of air or air handler in forced air furnace with the help of installation kit, connecting components and instructional video. If there is a floor drain system at your home, consider HE120 Drum Humidifier that needs no drain. While it humidify, it draws heat through moistened humidification pad which is included in package. This pad collects the invisible moisture. It also features PerfectFLO distribution tray which maintains fast and overall humidifier pad saturation to deliver even moisture of up to 18 gallons each day. 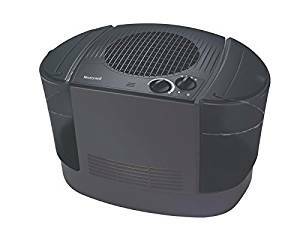 HE120 Bypass Drum Whole House Humidifier by Honeywell is best to give you basic humidification for medium to large size homes up to 4,000 sq. ft. It doesn’t required any drain system and directly get installed in your furnace to distribute around 17 gallons of moisture. 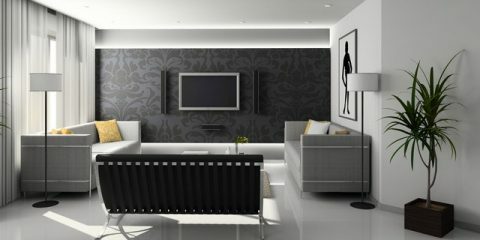 With instructional videos and installation kit, this unit can easily installed without assistance of any professional. Directly mount it in your furnace and connect water supply line. While humidification, water supply through drain line enters evenly over absorbent humidifier pad which is include in the package. Dry and warm air from furnace passes on humidifier pad, picking up moisture before it is dispersed across the home. This humidifier unit is controlled by standardized humidistat which is included in the package. You have to install it on return air duct or on wall. For humidity control, use combination relative outdoor/humidity temperature setting mentioned and refer to recommended table on owner’s manual. Although instruction manual are pretty clear, you might need a professional service to install it. 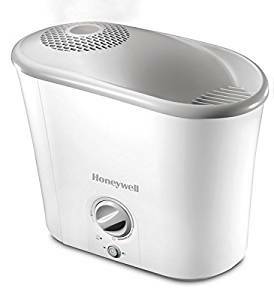 Honeywell HE240 Whole House Humidifier is one of the great products by Honeywell. It provide clean humidity up to 3,000 sq. ft. area and delivers up to 16 gallons of moisture each day. It special design keeps the unit clean of microorganisms by routine draining and cleaning itself rather than drawing stagnant water out from reservoir. Additionally evaporator pad help its filter to keeps hard water minerals and other impurities out and disperse clean air throughout your home. Thus you will experience lesser headache of maintenance and best overall performance. This unit is another whole house humidifier which work with forced-furnace and distribute cozy humidity across home. You can easily install it on hot air supply and return air duct of furnace and then connect it to drain line. It works with the warm air out of your furnace on water-soaked evaporator pad and wicks up the moisture to create moisture rich vapor. This warm humidity is then distributed out by air ducts to circulate across whole home. Have Hard Water? – If you have hard water, keep in mind that you might have to perform more frequent maintenance to keep this humidifier running optimally. 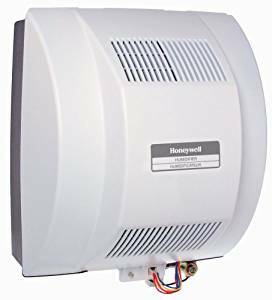 HE280 Bypass Whole House Humidifier by Honeywell is another furnace bypass humidifier that works with forced air furnace and provide 17 gallons of comfortable humidification using an efficient PerfectFlo Distribution system, to cover all the rooms of home up to 4,000 sq. ft. It easily get install onto return air duct or warm air supply of furnace and hooked to drain line with easy DIY installation. For operating it, warm air from furnace blows over water-soaked evaporator pad as well as wicks up moisture and create water vapor. After this warm humidified air is propelled out across air ducts and circulated across whole home. With easy to use control you can monitor relative humidity at your home and activates the unit when it falls below set level. With Flow-Through Design it clean microorganisms including fungus, algae, mold, bacteria and the like by routine rinse and draining rather than manually drawing the stagnant water out of reservoir. Not ideal for homes that are 20 years old. So expect to cover 2,000 sq. ft. area if your home is old. Although instruction manual help you to install it yourself, recommended is to hire certified professional, else guarantee will void. 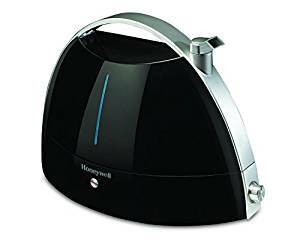 HCM-6011G whole house portable humidifier by Honeywell delivers 9 gallons of cool and soothing moisture every day and cover around 2,300 sq. ft. of area in multiple rooms. With humidifying it also washes away dust, dirt and pollen and give you clean air. Evaporative system and automatic regulator balances amount of moisture output to maintain right temperature. How its Air Washing Mechanism and Advance Mist Humidistat Works? It generates moisture and fresh air in 3 steps. In first step its pre-filter air washer captures dust, dirt, pollen and other pathogens from air. Then, antibacterial Protec Cleaner Cartridge prevents growth of mold, bacteria and harmful minerals buildup in humidifier. In the end, antimicrobial based wick filter stops growth of odor causing algae, fungus, and mildew on filter surface and inside the humidifier. Advance humidistat maintains humidity to ideals levels to avoid guesswork. When set, unit runs intermittently in order to maintain ideal level, deliver consistent comfort and saving energy. 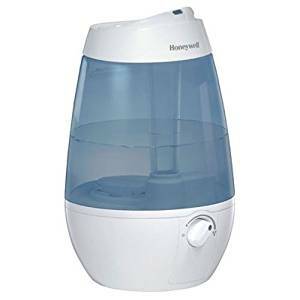 HCM-6009 QuietCare Console Humidifier by Honeywell not just provides you relief from symptoms of dry weather, but also reduce allergy symptoms. It uses exclusive Air Washing Technology, which cleans dust, dirt as well as pollen and delivers soothing and balance moisture to your home. It uses a combination of Protec Protection and Air Washing Mechanism in 2 steps. Fist its air washing pre-filter holds dust, dirt, pollen and other microorganisms. In second step its primary filter is treated by antimicrobial that helps to prevent migration and surface growth of fungus, algae, mildew, mold and odor creating bacteria in filter to give you cleaner and fresher air. Moreover it is designed with Protec Cleaning Cartridge that has advanced patented media for continuous inhabitation of odor causing bacteria, mold and harmful minerals build up. It also includes Advanced Mist Humidistat that automatically maintains ideal moisture level. It features 3 output speeds to appropriately humidify 2300 sq. ft. area. Not as quiet as I would like. 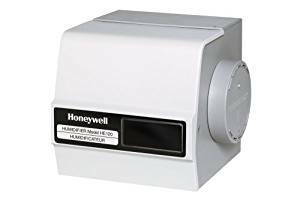 Honeywell HCM 315 T is designed for areas up to 700 sq. ft. It adds comfortable moisture to your room and eliminate waterborne germs also. 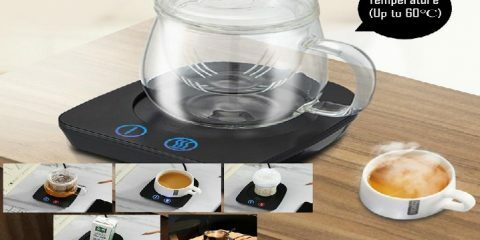 As it is a cool mist humidifier, it delivers a cool mist which humidifies your room and its patented on-board ultraviolet light immediately kills germs (fungi, bacteria, viruses and the like) up to 99 percent and impurities to keep water inside it clean and ensure germ-free, clean mist across your space. This QuietCare Germ Free humidifier also include adjustable controls that you can use to set humidity levels. These controls can easily be programmed electronically to raise humidity level inside room by 5 percent at a time. Operate continuously up to 48 hrs. Only suitable for single room up to 700 sq. ft.
HCM 750 by Honeywell efficiently and quickly releases moisture to your space and eases the symptoms of dry air like cold and respiratory issues. Its top-fill feature makes its filling as easy as watering plants. It comes with 3 setting and ability to disperse two gallons of cold moisture every day. It quickly starts to work and releases invisible, soothing moisture inside your room. Relatively Noisy because of Evaporative System that includes fan. Only meant to humidify single rooms but cater larger size. 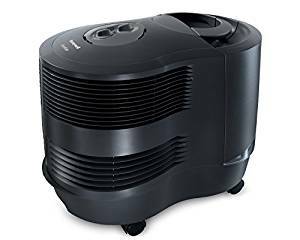 Honeywell HEV680 is a console type humidifier which is meant add invisible cool mist to large size rooms, basements and even for multiple rooms simultaneously. Its simple electronic controls help to customize humidity level and indicator tells when it reached the level desired or it is time for refill. Wick filter eliminates impurities form water and releases clean moisture. Replaceable filters also reduces dust. 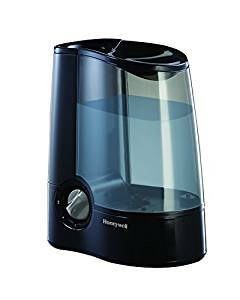 Feel therapeutic effects of warm and gentle mist with hassle free operation with this HWM 340 humidifier by Honeywell. It adds 3 gallons of soothing and warm mist in your home. It is best for larger spaces like large bedrooms, living areas, office halls and dens. Must be used with caution for pets and children because warm mist humidifying operation may pose slight burn risk. 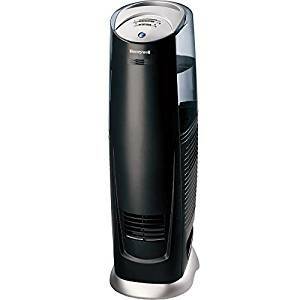 HCM 350 by Honeywell disperses up to 2 gallons of comfortable mist each day and cover 360 sq. ft. of area. Place it on corner table, nightstand or counter top. This humidifier was recently endorsed by consumer reporting magazine where it received high points in user convenience, moisture output, lowest noise, overall efficiency and even hard water resistance. This cool mist system deliver rightest amount of moisture by automatically regulating cool moisture output through evaporative technology. This moisture naturally adjusts to ideal indoor air temperature and eliminate guesswork. 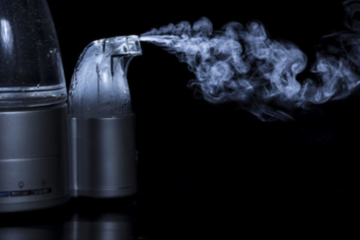 Traditional humidifiers quickly become host of bacteria, viruses and other harmful microorganisms. HCM-350 combats germs with 2 step germ killing process, 1st an antimicrobial filter which absorbs pollutants and minerals and avoid mildew and mold growth with time. 2nd, ultraviolet germicidal light glow on reservoir to kill viruses, bacteria, penicillium fungus, and all other pathogens give up to 99 percent of clean and safe air. If you need to measure ambient humidity or make it simple to maintain exact humidity, buy it separately. 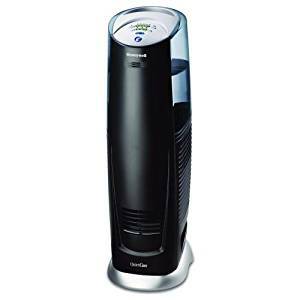 Add moisture and save space of your room with customizable, affordable Honeywell HEV312 Coolest Tower Humidifier with 1.7 gallon capacity to add invisible mist for 24 hr on lower setting. It is designed for large single room. 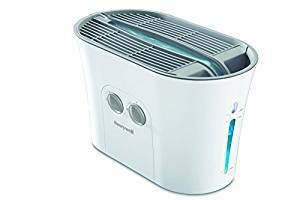 This functional, fashionable and portable Honeywell HUT 300 whole house humidifier is best for living rooms, bedroom or any space up to 250 sq. ft. Its built in night light and noiseless operation makes it perfect night time partner. It adds up to two gallons of moisture every day. Select higher humidity level for dry climate or when you need fast relief. Select lower setting to maintain constant healthy humidification to avoid dry weather symptoms whole day. Only for single rooms up to 250 sq. ft.
Make your room comfortable with HUL-535 cool mist option by Honeywell. Variety of settings to adjust humidity level for more comfort. It includes 1 gallon which delivers your several hours of output. With easy manual control you don’t need to fumble with buttons or find how to change its settings. Honeywell HWM-70B releases invisible soothing mist of vapors which gives ultimate relief from low humidity and discomfort related to it. This table size humidifier is designed mid-size rooms and runs for complete day on single filling. It pumps water from a gallon reservoir and disperse it by whisper-quiet fan and wicking filter. 2 moisture output levels, automatic shut-off and refilling indicator which make it an easy and simple way to raise humidity and comfort level in your home.